Excel 2016 replaces the Research button on the Ribbon’s Review tab from previous versions with a new Smart Lookup button. 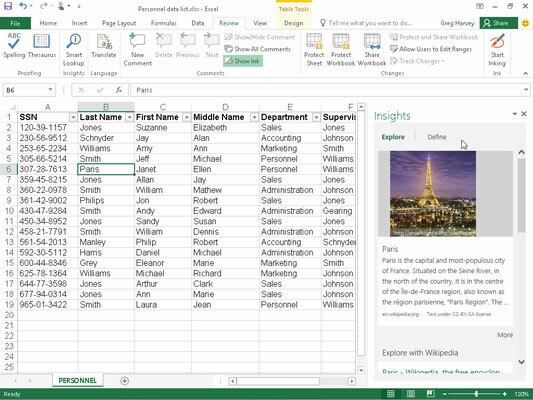 When you click the Smart Lookup button (or press Alt+RR), Excel opens an Insights task pane (similar to the one shown here) with information about the entry in the current cell of your worksheet under an Explore tab. Researching Paris, France in the Insights task pane using the new Smart Lookup feature. Actually the very first time you click the Smart Lookup button on the Review tab, the Insights task pane displays a privacy message rather than information about the current cell entry. This message informs you that some data from your worksheet will be shared online with Bing Search and invites you to review its privacy rules before proceeding. You must then click the Got It button at the bottom of the Insights task pane in order to proceed with the online search. Once the Bing Search engine displays information about the current cell entry on the Explore tab of the Insights task pane, you can scroll down to peruse the particulars and even follow any interesting online details by clicking the appropriate hyperlinks (which open the relevant web page in a separate window in your default browser). If you want a definition for the current cell entry rather than related information about it, simply click the Define tab at the top of the Insights task pane. Excel then displays a definition for the current term contained in the current cell. If appropriate, the definition will include the latest statistics about the defined term. If you want to hear how the defined term is pronounced, click the speaker icon near the top of the Insights task pane. When you’re finished researching the term that’s entered in the current worksheet cell, close the Insights task pane by clicking the pane’s Close button in its upper-right corner.